MarTech Role Finally Recognized as a Real Job. Let's Explore. It’s finally happened — the MarTech role is a real job — or at least it’s at last recognized with the Marketing community as a real job. Imagine that. So how does that happen? Who gets to decide which Marketing roles are considered mainstream? That’s fairly simple—it’s major Marketing research experts like Gartner and others. In fact, Gartner’s recently released 2018 Gartner Marketing Technology Survey is pretty interesting, especially if you’re curious about what’s going on as it relates to MarTech. Let’s take a look. 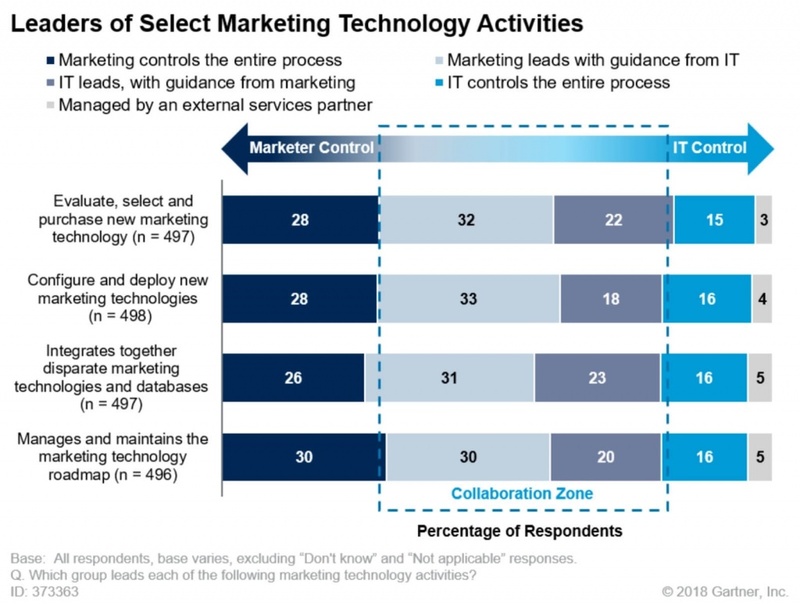 One of the details Gartner’s survey focused on was which department typically works with marketing technology. As if it should come as any surprise to anyone ever, it’s the Marketing department! Who would have thought? Actually, that’s not such a dumb question, because in years past, anything having to do with technology was actually under the purview of and managed by the IT team, so this recent change is actually kind of a big deal. Back to the data. Gartner’s survey found that in 74 percent of enterprise companies, the Marketing department manages MarTech. And in 26 percent of those companies, there’s a dedicated MarTech leader and team, which would have been unheard of years ago. This is a good development, because the report indicated that survey respondents whose company had a dedicated MarTech team and leader were more likely to state their marketing maturity was at a higher level than companies that didn’t have dedicated teams or leaders. Only makes sense, doesn’t it? How Does IT Figure Into the MarTech Role? Though the Marketing team mostly manages MarTech, that doesn’t negate the huge role of technology—and therefore, the importance of the IT team, as it relates to MarTech in general. It only makes sense that the Marketing department still collaborates with IT on a regular basis when managing MarTech. In particular, Gartner found that “Marketing leads with guidance from IT” for numerous important processes. For example, 32 percent of survey respondents reported they need guidance from IT when evaluating, choosing, and buying new marketing technology, while 33 percent reported they need that guidance when configuring and deploying new marketing technologies. As you can see, neither Marketing nor IT completely controls MarTech at most companies, they both work together on this. 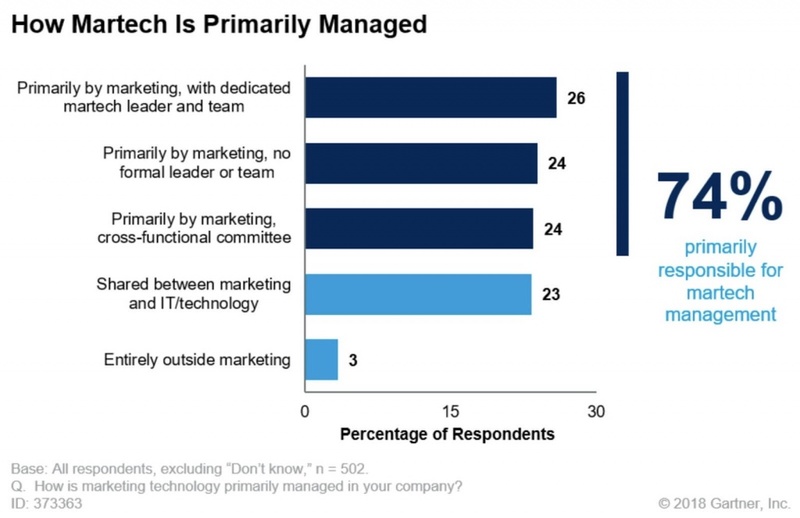 That being said, the Marketing Department tends to have the most control, as 30 percent of respondents reporting that Marketing fully controls the process of managing and maintaining the MarTech roadmap, while only 16 percent reported that IT fully controls the same aspect. What Else Should You Know About MarTech? Gartner’s findings don’t stop there. The survey also discovered a few other tidbits you might want to keep in mind. For example, the average MarTech team has 25 dedicated employees, so these professionals are not alone as they navigate the marketing technology world. And companies with revenue up to $10 Billion on average tend to have 32 MarTech employees. On average, marketers use five sources to help inform new marketing technology purchases. The UK and Canada are behind the U.S. when it comes to usage in 34 MarTech categories. Over 40 percent of marketers consider growth to be the key performance indicator in MarTech. The top emerging technologies among marketers include real-time and event-triggered campaigns, with AI and machine learning being most popular. The bottom line is clear—MarTech is finally a mainstream marketing role and it’s an important one. Whether you’re exploring MarTech for your next job role or want to expand your marketing team to include MarTech experts, you’re not alone. Technology is driving every business, in every industry today and the role technology is playing as it relates to the discipline of Marketing is no exception. Want to get the full scoop from the Gartner report, download it here — Marketing Technology Survey.